I love hip-hop and rap music; they’re my favorite genres. Don’t get me wrong, I like jazz, R&B, reggae, soca, salsa, hard rock, pop, alternative, and etcetera, so I do have diversified taste. However, what makes me go crazy/lose my mind is words on a drum beat. I’m not a radiohead, but when I listen to music, my first choice is rap. 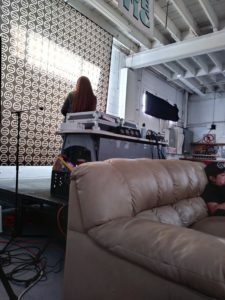 I found out about the perfect spot for me on the SF Funcheap website, 01/17/18: The Hiero Beats Cafe, “a free creative space to work, make music, chill, eat, smoke, and sip hot drinks and discover the best hip hop, soul-jazz and Afrobeat tracks that don’t get enough shine on mainstream channels.” Excited to also learn about their free wifi, I added the event to my calendar. I had to hunt for this place. The address said 1200 50th Avenue but if it wasn’t for the fact I could hear music, I’d have walked another block. I was standing on the corner twisting and turning like I was in the matrix. In front of me was East 9th Street and I could see the BART train tracks. Kitty-corner was what appeared to be a closed entrance to a door that read WaxPoeTic. To my left, non-apparent buildings, but to my right, there was music that sounded like it was coming from a double parked car. 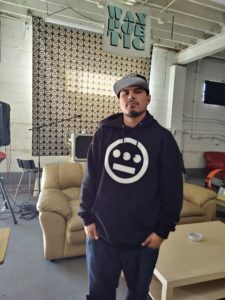 After several minutes, I decided to go in that direction and finally across from it, I could see an open door with the hiero logo on it, that turned out to be Hiero Beats Cafe! My first impression was — it looks more like a SF/Berkeley-style hangout, with lots of used sofas, for I had expected table and chairs. I continued walking in, smiling and speaking to the dejay, hostess, and a couple of patrons. 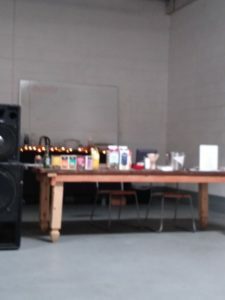 I sat my belongings down, looked around, most particularly at the vinyl wax station, when the hostess invited me to have some coffee or tea. I learned the beverages and food are for the donation of $2-5. I later inquired and found out the vinyl albums cost up to $20. I thought the ad said the cafe was new. I didn’t realize it until arriving at the front door that I had been there once before. I assumed it was a re-opening. The hostess said they’ve always been there and I re-learned it’s open every third Friday from 11 am-6 pm. I guess I didn’t add that to my calendar the last time but have now. 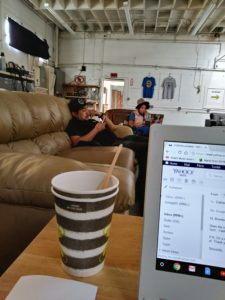 The place is big and the atmosphere was relaxed and comfortable with great music and videos as I pecked away at my computer until a half an hour before closing. There were about 15 patrons during my visit. 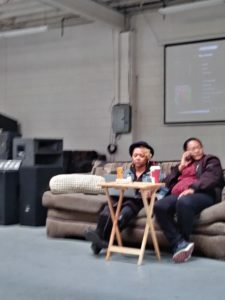 A few were smoking marijuana (legal to all adults now); a few, on their laptops; two women who appeared to be friends sipping on coffee and tea like everyone else; a fella with his electronic keyboard and there was one group of four in deep discussion. The ad said they have a recording studio but I didn’t venture off to see it. I’m always up for some extra cash and adventure so it did interest me but I had a few shopping bags with me. I believe I can hold a note and used to joke about how I can for sure sing two lines of lyrics over and over again in a rap song. I didn’t make any connections but left with a couple of demo tapes I can’t wait to listen to, some stickers and I signed up to participate in an upcoming video. The cafe is run by Hieroglyphics Imperium based out of East Oakland since 1997. The offices are on top of Beats Cafe. I had volunteered for their annual concert that was held in West Oakland last September which is why I associated with the name Hiero. 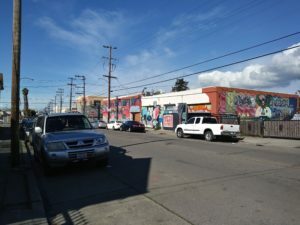 Believe it or not, I missed the volunteer orientation because I couldn’t find the place, stopping across the street from it and ending up near 50th Street in North Oakland! The event was a huge, hip-hop/rap music scene with many food and merchandise vendors. I emailed them eight questions to complete my article. Tell me something about the cafe and Hieroglyphics that isn’t already available online. How was the cafe idea derived? How long has it existed? How many members are there in Hieroglyphics? Who/what is waxpoetic, a record label, a deejay? How many albums are on your label? Who/how came up with your business logo? 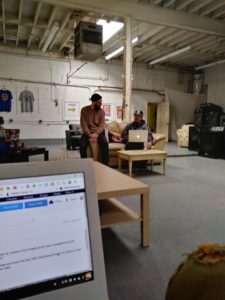 How much does it cost to use the studio and when is it available? A few days went by and I hadn’t received a reply to my email but lucked out when I received a notification from Facebook that they were opening that day. I lucked out again when I arrived and the deejay, who I later learned was filling in, was there alone. 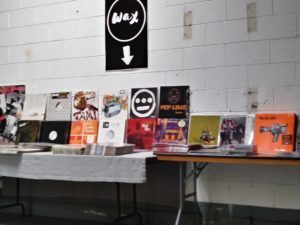 Branden aka Bsidez510, who runs their merchandise warehouse and website ,graciously shared that he came to the company and label Hieroglyphics Imperium Recordings approximately five years ago. He grew up listening to the group of nine that has four collaborative releases to date on their independent label. He’s not included in the original group including Soul Mischief (Tahjay, Opio, A+, Phestodec), Dell, Casual, Pep Love, Domino and DJ Toure, but has been involved in a few of their projects. Casual is the CEO who grew up around Seminary; Dell is a producer and MC; Pep Love runs Wax Poetic and Beats Cafe; Domino is a producer and manager. Individually, they each have four to five separate releases. Bsidez510 has a CD that will be released later this year. Tonya Shipp is a mother of two and avid supporter of education and development. For the past ten years, she has been freelancing and working through staffing agencies in the San Francisco Bay Area but recently began as Program Aide at Building Opportunities for Self-Sufficiency. 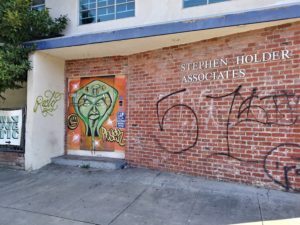 She obtained an associate’s degree in the social sciences from Laney College and is one class shy of receiving a bachelor’s degree in Business Management. She also served eight years in the Army Reserves before being honorably discharged. She volunteers regularly at the events and offices of non-profits. Having experienced extensive periods of homelessness, unemployment and being without dental coverage is a strong advocate for the poor.